This week in Blue Class we have been in a Football Frenzy as we approach the World Cup. The children were put into groups and assigned a home city around the world. Each group then came up with a name for their football team and designed their kit. With a budget of £70m and a limit of 1500 player points, the groups then had to put together a squad of 15 players. 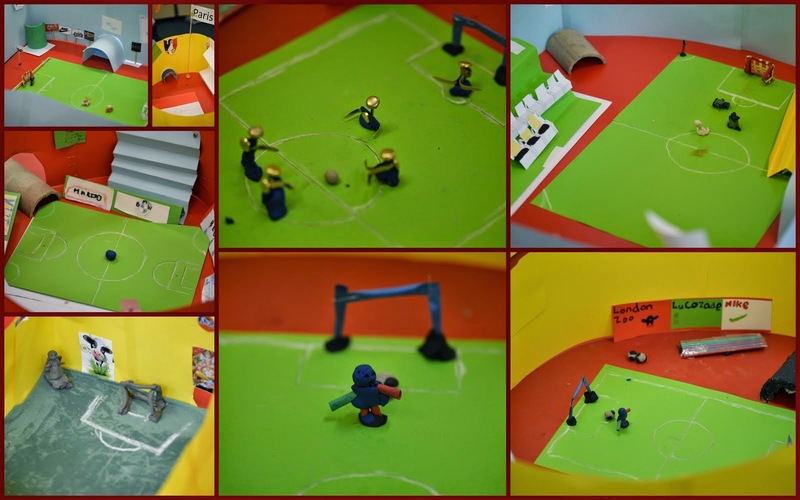 The groups designed and built their own football stadiums, which had to meet a given set of criteria. Each day the groups had to put forward two teams, taking into account injured players, to compete in two matches. In each match, the team with the highest player points won. On Wednesday the groups were given the opportunity to boost their teams with a transfer day. Corporate sponsorship gave them an extra £500,000 per win. Following the transfer window, an additional two games were played on Wednesday. On Thursday, the children learnt how to write a match report. An example is shown below. Berlin Bears V London Lions Results. No travelling was needed for the Berlin Bears when they had a match against London Lions right in their home, Berlin. They had a match which had the audience on the edge of their seats with a strong result of 2-0. The crowd was buzzing as we started the match on a rather nice day with the sun shining brightly on the lime green rug within the stadium. On 13 Gerrard started off through the middle getting at least 16 yards before the Wild Cats’ striker pulled in front of him, forcing to feed Noone his precious cargo. All of a sudden Noone curled round Davies and nodded the ball successfully into the awaiting net. The spectators went wild, even the 272 from London. After Michael Solmen shouted for play, this time London’s forward, Cattermole burst ahead passing back and forth with Campbell. Getting too close for comfort for the Growlers Campbell nodded it wide and a disappointed murmur spread across the crowd. At the next whistle, the players gathered in the center for half time. After that the players trooped into the tunnels. The long whistle signalled that they had to come out. Whitaker took the center pass and stabbed it straight to Shelvey, Shelvey received it even though the wild cats’ midfielder Cole gave all his effort to block the pass. So Shelvey was off playing into the space on the right, dodging and sprinting, the ball always in front of him until Cole was back again sending in a slide-tackle within a whisker of Shelvey’s shin. Now with 3 minutes left in the game the Wild Cats’ center pass went to Jenidae however he only got 19 yards before the last whistle sounded. It was over. The growlers won and celebration was in store! By the end of the week, tensions were high as the top teams, Rio Mosaic and Paris Penguins battled it out for first place, while Brahman and The London Lions were trying to avoid relegation. Wow, what a game! So much action and no fouls.